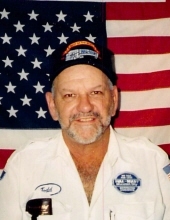 Ralph L. Todd 72 of Bentonville passed away January 24, 2019 in Springdale. He was born March 19, 1946 in Dallas, Texas the son of Ralph and Opal Fulks Todd. He is preceded in death by his parents and one son Richie Daniels. Ralph was a truckdriver for 31 years for Walmart and a member of First Landmark Baptist Church in Bentonville. He was an avid St. Louis Cardinal fan, enjoyed riding his Harley and watching western movies. He will be dearly missed by his wife Shirley Beck Todd of the home; his sons Doug Todd and Craig Todd both of Bentonville; his brother Gerald Todd of Colorado Springs, Colorado; his sister Velma Mozingo of Hickory, North Carolina; ten grandchildren and two great grandchildren. To send flowers or a remembrance gift to the family of Ralph L. Todd, please visit our Tribute Store. "Email Address" would like to share the life celebration of Ralph L. Todd. Click on the "link" to go to share a favorite memory or leave a condolence message for the family.